And on the 5th day they went back to work and school. I feel like I've been on an early Spring Break, all be it one where I am stuck at home the whole time. Thanks to unprecedented snow totals over the last week and terrible neighborhood plowing efforts, today is the 2nd day I've been at work since February 4th. When the storm of the millennium was forecasted for last Friday into Saturday (AKA the Alex Rose birthday storm) and I decided to stay home, little did I know that I wouldn't be back to work until Tuesday, followed by an additional two days at home. Now I'm not saying that I don't like to spend time with my family, it's just that getting work done is not very easy with two energetic boys running back and forth between the living room and kitchen 3 to 4 hours a day. Thankfully we managed to get Josh more interested in Wii Fit Plus so he could expend some of his energy in a more constructive manner. By now, you've probably seen countless pictures of people's snow accumulation at home. I'm throwing my own few shots into the mix which you can check out at the end of this post. Bottom line is that I feel like I'm 14 years younger and back living on South Campus up in Syracuse. This is sort of appropriate considering the Orange basketball team is off to their best start in school history (24-1, ranked #2 in the nation). As a snow lover myself, I'd never thought it would actually get to the point where I'd like to see a break from snow for now. So finally, today the kids are going back to school (DC schools have been closed since February 5th and even though they are closed today, Josh and Alex's school is thankfully open). Josh can't wait to get back to school while I'm sure Alex won't enjoy the return. I don't know if the kids will ever get 5 consecutive days off from school again in this area. It's too bad for Josh because I know he'd appreciate the time off more when he's older and isn't as enthusiastic about being at school. I know when I was 7-10 years old that I really enjoyed the rare snow days that came our way. For those of you who forgot (and believe me, this event is not getting enough pub), the Winter Olympics commence tonight in Vancouver with the opening ceremonies. I am running the Olympic office pool at work and am looking forward to watching some of the games on NBC, especially the Men's Downhill tomorrow night (watch out for Bode Miller). I may be in the minority on this, but I love me some Olympics (Summer or Winter). 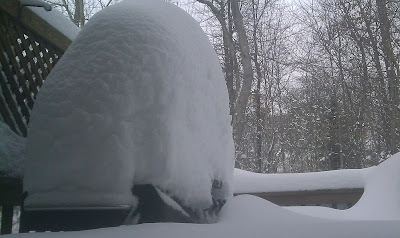 Pretty sure we won't be grilling anytime soon. 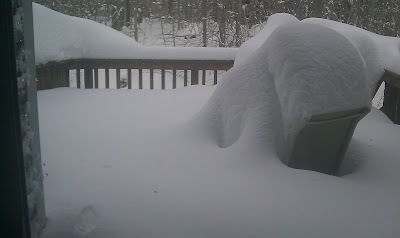 Our deck during Snowmageddon. Looks like the Stay Puft Marshmallow Man was murdered here. 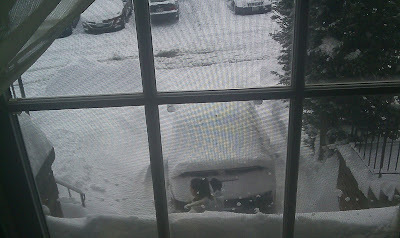 Glad to hear that you are finally digging out. It's interesting that this winter New England didn't get much snow but y'all got slammed in the Mid Atlantic. And I am happy to be sitting in North Carolina where we get approximately 2 inches of snow a year! Indeed! We OWN New England in snow this season. We in NE are happy to acede the snow title to the mid-Atlantic. SUCKERS! Hello fellow Olympic lover! I was just sad that they didn't start a week earlier so that it would have been Olympic heaven watching them on our snow days. Oh well.